Science time. Fasten your seatbelts! Before we get into it, let’s address the clickbait title. It’s exactly about that, this post. Getting baited and scared into buying things. Know how they get you! 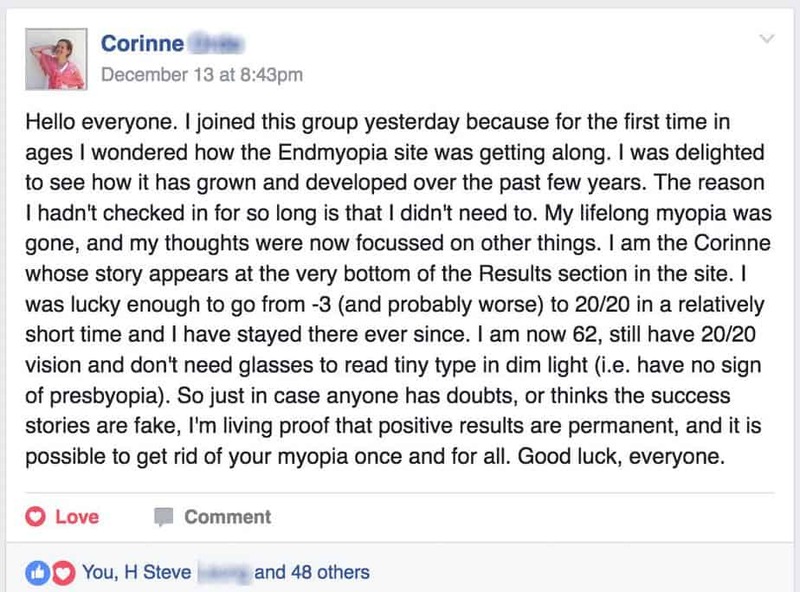 First, I want to show you that clinical science knows a lot, a whole lot more about the eye than most of the retail outlets we have all frequented for myopia advice. Let’s see that the so-called optometry medicine has little to do with optometry science. 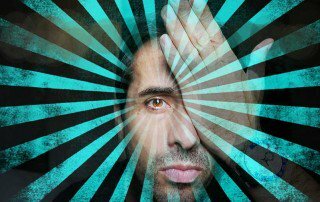 Retail optometry owns the right to make certain claims (lobbying & shady law making, yay!). But some of that stuff might not be science. Second, I want to help you see that it’s easy to be mislead by misuse of science. I run into this a lot, science and studies being used to yet again turn around and sell you more stuff. Creating paranoia around bits of truth, making you feel like you’ll never understand it all, make you trust some supposedly big brained individual, fall into that trap. It’s all a trap, Jones. I’ll show you why. I read through most of this study (thanks google scholar) that talks about a possible mechanism for how the eye uses chromatic aberration to guide its emmetropization. I find this very interesting because plastics have varying Abbe numbers (how much added aberration they cause in and of themselves). Polycarbonate is particularly bad, while standard cr-39 is pretty okay. I remember back when I still had expensive glasses with poly, looking at OPEN signs at night at a slight angle, and the red open being entirely out of the blue light tube that should have been around it. Two reason I no longer see it: Cheapest lenses from Zenni, and the prescription I use at night (my normalized) is probably too weak to see those neon signs in focus (without lots of active focus and double vision which would obscure that chromatic aberration in and of itself). Here’s the link to the study Val mentions. Longitudinal chromatic aberration (LCA) causes short wavelengths to be focused in front of long wavelengths. This chromatic signal is evidently used to guide ocular accommodation. We asked whether chick eyes exposed to static gratings simulating the chromatic effects of myopic or hyperopic defocus would “compensate” for the simulated defocus. We alternately exposed one eye of each chick to a sine-wave grating (5 or 2 cycle/deg) simulating myopic defocus (“MY defocus”: image focused in front of retina; hence, red contrast higher than blue) and the other eye to a grating of the same spatial frequency simulating hyperopic defocus (“HY defocus”: blue contrast higher than red). The chicks were placed in a drum with one eye covered with one grating, and then switched to another drum with the other grating with the other eye covered. To minimize the effects of altered eye-growth on image contrast, we studied only the earliest responses: first, we measured changes in choroidal thickness 45 min to 1 h after one 15-min episode in the drum, then we measured glycosaminoglycans (GAG) synthesis in sclera and choroid (by the incorporation of labeled sulfate in tissue culture) after a day of four 30-min episodes in the drum. 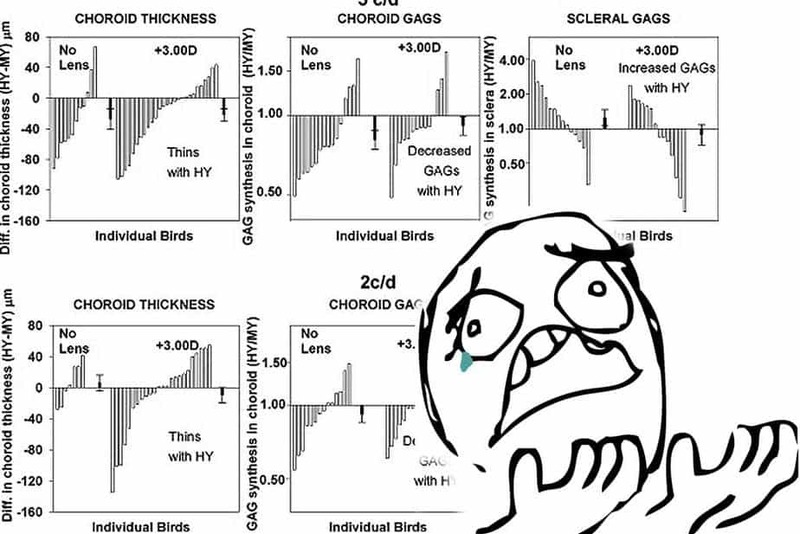 The eyes compensated in the appropriate directions: The choroids of the eyes exposed to the HY simulation showed significantly more thinning (less thickening) over the course of the experiment than the choroids of the eyes exposed to the MY simulation (all groups mean:−17 μm; 5 c/d groups: −24 μm; paired t-test (one-tailed): p = 0.0006). The rate of scleral GAG synthesis in the eye exposed to the HY simulation was significantly greater than in the eye exposed to the MY simulation (HY/MY ratio = 1.20; one sample t-test (one-tailed): p = 0.015). There was no significant interaction between the sign of the simulated defocus and either the spatial frequency or the presence of a +3 D lens used to compensate for the 33 cm distance of the drum. Although previous work has shown that chromatic cues to defocus are not essential for lens-compensation, in that chicks can compensate in monochromatic light, our evidence implies that the eye may be able to infer whether the eye is myopic or hyperopic from the different chromatic contrasts that result from different signs of defocus. Let’s get back to the points we started out this whole post with. If you start digging into all the proposed mechanisms that guide the eye’s axial change, you’ll find yourself amazed at the depth of data and studies available. A lot of smart people really spent a lot of time looking at how the eye uses environmental stimulus to make sure you get excellent vision. Contrast this with most chainstore optometrists. I’m not going to speak ill of them. A smart reader once pointed out that most of my frustration comes from the fact that I confuse so-called medicine, with science. That if we were to separate the two, medicine entirely separated from science, we’d be much less annoyed with the so-called optometry (retail) profession. Optometrists simply are not scientists. It’s an entire different profession. 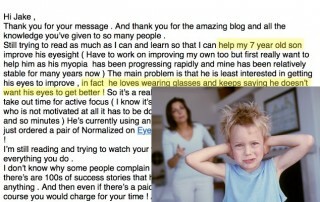 They went to school and were taught diagnose and treat your myopia symptom in a specific way. 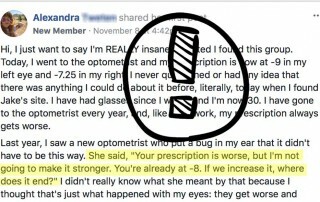 They work in a shop that sells lenses, and they’re licensed and incentivized to “prescribe” those to you. So that’s what they do. Do they know much about axial change? No. And why would they? It’s like being mad at a fisherman for not knowing how to fix your car. So when you’re looking for answers, try an interesting concept: Put medicine in one folder, and science in the other. Put various claims and ideas in each respective folder (physically or just conceptually). See what ideas and concepts suit you and your particular pursuit and goals. One thing you won’t ever catch me do, is try to confuse you with a bunch of jargon. I hate, hate, hate going to sites or visit professionals, and have them talk to me in a way they full well know I can’t understand. It’s a very specific way of communicating, geared solely to make you feel as though you have no control, and aren’t supposed to make educated choices for yourself. Especially if I’m paying for advice, I will literally ask the person to stop talking, and restart their explanation with terms that they know I will be familiar with. Because kittehs, f*** that noise. Don’t let anyone talk down to you. Take the chromatic aberration as example. 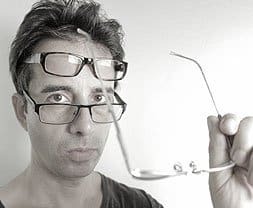 I could go on and on and on here how those signals affect your myopia and how you need these lenses and those lenses, and not look at this light and that light. I could inundate your poor little brain with fancy words and clinical terms and charts and graphs. Point to the fact that you have myopia, and that you don’t have any special lenses and you look at all the wrong lights (bad kitteh, bad! ), and then tell you that you either pick me to guide you, or suffer the consequences of staying in the crap spot you got yourself into. Make you feel frightened and insignificant, and needing me to help you. Lots of science showing that I must be right. Right? See what I mean? There’s logical bits connecting the dots, plus some science and jargon to make you feel inadequate. But that’s a trick, too. It’s just another way to sell you things. And while it’s been rumored that Jakey does know a thing or two about vision biology, most of this site is you and me having a conversation like two normal people. I’m not throwing around big words to make it seem like I’m special and better than anyone. In it’s all about much of the opposite. Self deprecation and simplifying things to core concepts. I want you to feel (and realize the truth!) that this is very doable, very simple, approachable, non-threatening. If this dummy Jake can do it, so can you! Become your own eye guru. Back to the science. So, do you need special lenses to manage chromatic aberration? Do you need to worry about light colors and filters for light spectrum bits and things? Yes sure, maybe some of it plays a role (it does). Does it matter though, between you and me and as far as making the 20/20 gains? We have a decade of using cheap(ish) lenses with literally thousands of students, of skirting the line with high index to just where it’s really necessary, of not using special filter coatings and special secret ingredients. We’ve also tried fancy lenses and other tricks, from time to time. We’ve looked for shortcuts and special sauces. And all this experience tells us that there’s no need to overcomplicate or follow some Jake-so-special, secret recipe. Simple works just fine. 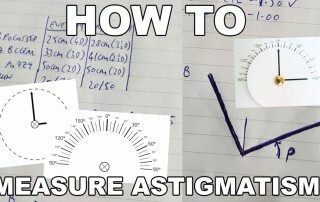 Your lenses are probably polycarbonate (unless they’re cheap low diopter CR-39). And that’s ok.
Don’t be intimidated by the science. Ask me (or search the site), if you’re not sure. Realize that while there are a million things affecting a million other things, most of it tangibly doesn’t actually matter to you and your vision goals. Don’t overanalyze studies and sales pitches out there and end up in an emotional spiral, getting all hypochondriac, worrying about every twitch and flutter. Relax, sit back, chuckle at the various realities of science and medicine, try out Jake’s way of make-it-simple-or-gtfo. It may work for you. Caveat and Disclaimer: Get regular eye checkups. 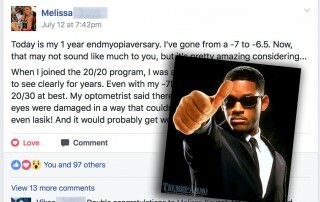 Ophthalmologists are worthwhile and they know stuff. 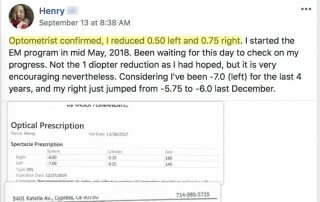 We’re just talking about simple myopia here, not about medicine, and there are plenty of things that can go wrong that you want a heads up on. Your darling eye guru goes for regular eye checkups, and so should you! Also a bit of discussion about that study in our Facebook group, here.